Not only are Serving Carts elegant, they keep you from spilling everything all over the place. Scandinavia, Inc. offers a nice selection of modern, contemporary serving/tea carts and tables for serving your guests. 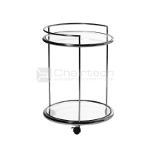 Serve tea or coffee to your friends easily with a sering/tea cart or trolley in wood or glass and metal to match your home décor. Carts also provide storage underneath for keeping occasional pieces for entertaining.